With all the excitement and hype building for the new Opensource Scan Converter, there’s demand amongst retro gamers for a readily available way to convert S-video and even composite into RGB or component video. Since the OSSC only accepts RGB and component video, gamers wanting to connect the C64, 3D0, various old Atari systems or other more esoteric hardware will need to find a transcoder. Theoretically at least, this little box from Lindy should be just what we need. At £72.94 it’s not cheap, but at least it’s readily available. The converter ships in a plain white cardboard box with a Lindy label applied to the exterior. Inside, apart from the converter itself, there’s a simple instruction manual and a multi-region power supply. The converter itself has a button to change between composite and S-video and a switch to change between component video and RGB with sync on green output. For this price, we perhaps would have expected the much more common RGBs output too, but sync on green is all we get. Connecting cables is straightforward and there’s no configuration options other than the output switch. For testing, we connected a Commodore 64, a classic computer that unfortunately offers no RGB output at all, to our XRGB3 initially. Regrettably, instead of a nice, stable image, instead all that was output was a picture that constantly rolled/scrolled up the screen. Thinking the XRGB3 must be at fault we tried the unit on another television set, this time with no scaler/processor in-between. This produced the same result. We also tried the unit through the XRGB Mini upscaler, which again produced the same results. In both instances, connecting the C64’s S-video output directly to the XRGB Mini or the television resulted in an image that was perfectly stable. We reported the fault to Amazon and they immediately sent out a replacement unit, but that behaved in exactly the same way. We even tried the unit in RGB output mode, using a Keene Syncblaster Black Box to convert between RGsB and RGBc. This produced the same result again, the constantly rolling image. Why the unit fails to work with the C64 is a real mystery. Obviously, most of our readers will be aware that a Commodore 64 outputs a 288p signal which can cause issues with some modern TVs and video hardware. However, the converter is only supposed to be doing a very basic conversion, not scaling or otherwise processing the image, so really there should be no reason that it doesn’t work. Based on its performance here, we would not recommend this converter. Maybe it will work with other hardware, such as the 3DO, but why take the chance? If the unit can’t work with the C64, it’s likely that other sources will have issues too and for the asking price that’s just not acceptable. Just not fit for purpose as far as gamers are concerned. 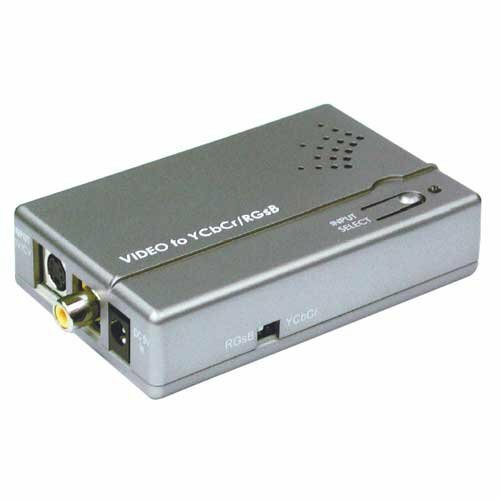 Did you at least test the unit with an NTSC video source? I don’t have any consoles that are S-Video only and NTSC. The documentation that comes with the unit says PAL is fully supported. I’m looking for something like this for my Atari Jaguar. If you could test that and let us know how it works that would be very helpful. Why would you use it with a Jaguar? Jaguar has very good quality RGB output. Have you tried connecting it to an OSSC? It appears the NAD TT-1 has the same scrolling problem. Does the OSSC have a vscroll adjustment control like the old analog TVs did? I meant v-hold, not vscroll. What kind of svideo cable did you use from the c64? The levels of the c64 output does not adhere to standard svideo levels. Adding a 300 ohm resistor to the chroma signal (pin 6 as described here https://www.commodoreserver.com/BlogEntryView.asp?EID=F4B967500A894E10BE4A104C65DB541E) might fix the issues you had ? I believe the cable already had that. What about a c64 equipped with a LumaFix64 ? This mod cleans up the Luma (which also carries sync) so this could potentially fix the sync issues? Worth a shot but I wouldn’t hold my breath. Would be nice to test it with other svideo sources as well. Just saying that maybe we should not dismiss this unit just because it failed to work with one system that is know to output non standard svideo signals. Tested with LumaFix – the same issue. This is a little late, but I have been experimenting with this device for a couple months now. I tried S-video with my N64, 3DO, and Commodore 64. I had the rolling problem as well. I have some older RF consoles that are all modded for composite – 7800, Colecovision, Intellivision, and Magnovox Odyssey2 – All rolling. Eventually I was able to get the rolling picture to stop by unplugging the converter and plugging it into another outlet. But then after a few more tries, it went right back to the rolling. Has anyone found a better solution?